Interior design is easy when you add this high quality Artistic Weavers Saffre area rug to your home. Decorate the right way with this indoor piece constructed from plush wool material. A durable product is assured with this hand-made rug. This blue rug has a stylish trellis pattern for your modern dicor needs. High quality and high style, this Artistic Weavers Aceval area rug is extremely useful in any home. Complete your home's contemporary design with this indoor/outdoor rug made of plush synthetic material. This hand-made rug will make a bold statement in your home that lasts. Bring this floral plants patterned blue rug into your living spaces for a contemporary design aesthetic. Interior design made simple with this contemporary Artistic Weavers Camarillo area rug. Bring this high quality plush wool indoor rug into your home to upgrade your interior design immensely. Its hand-made construction is sure to endure the constant treading of feet and furniture. Make a bold statement with this oriental patterned blue rug. Saffre Blue 5 ft. x 8 ft. Indoor Contemporary Rectangular Area Rug Interior design is easy when you add this high quality Artistic Weavers Saffre area rug to your home. Decorate the right way with this indoor piece constructed from plush wool material. A durable product is assured with this hand-made rug. 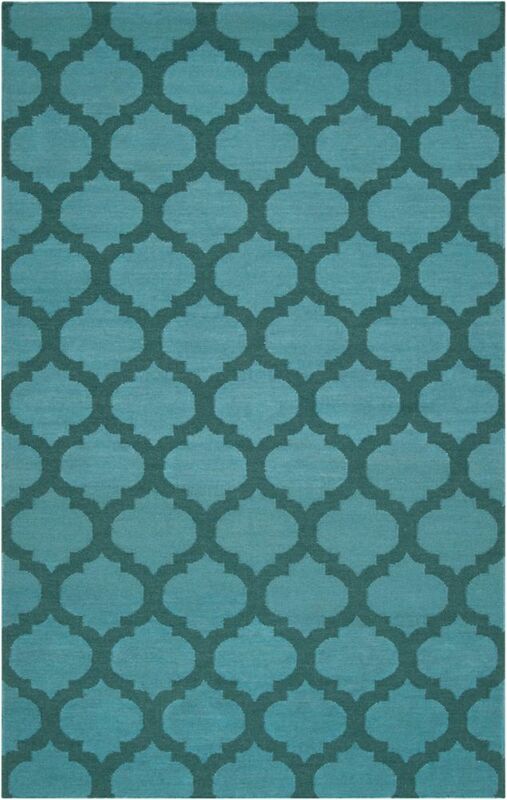 This blue rug has a stylish trellis pattern for your modern dicor needs.